Welcome to a new edition of the Team Santa Inc. News Daily. We’ve got unusual yet very popular Halloween Decorations for sale. Twenty eight different decorations to be exact. Please see our selection of black artificial Halloween trees. We have black trees up to 14 feet tall. With or without lights pre-installed. So what happened that the black Halloween tree went viral? Here’s the skinny —> apparently, a very popular network television show had featured a lighted, black Halloween tree in a recent episode. The viewers watching the show must apparently be avid Halloween decorating enthusiasts, because once the show aired, our selection of black artificial Halloween trees diminished quickly. The big trees are pretty pricey so when we started to sell 2 then 5 then 8, it was obvious that something was going on. One of the customers who purchased a black artificial Halloween tree had emailed Team Santa Inc. to ask us whether we saw the television show. Unfortunately, we did not. We have always carried black artificial Christmas trees, but we sell them as black artificial Halloween trees. The Team Santa Inc. Halloween buyers for the web stores, assume that there’s no telling what a Halloween decorating enthusiast might use as a Halloween prop. This is the reason we carry the black artificial trees in sizes up to 14 foot. The trees when used effectively, will make awesome Halloween decorations. You can order a small 2 foot black artificial Halloween tree for your desk or a 10 foot artificial black Halloween tree for use in your outdoor display. The product can be used outdoors for your Halloween decorations display for no more than 60 days. If you want to use the tree to decorate the inside of your lair or haunted house, the tree is perfect. Team Santa Inc. has black artificial Halloween trees in all sizes. Black trees with lights and without lights. However, as a result of the television show, we have sold almost through our entire inventory which is great but we want to satisfy as many decorating enthusiasts as we can. So if you want a black artificial tree to use for Halloween, get over to Christmastopia.com fast before the trees are all gone. Halloween is in three weeks and many of us are still not decorated. 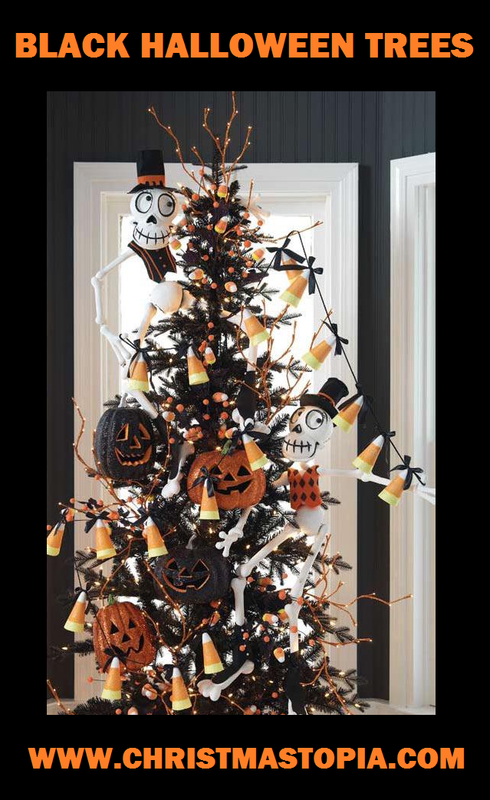 Team Santa Inc. has spooky black Halloween trees from 2 feet up to 14 feet, so stop by soon and see the trees. We’ll keep the light on for you. Until next time..